The 50 mile course will have approximately 11,130ft of vertical gain. Click here for detailed course maps and elevation profiles. Click here for aid station locations and aid, drop bag, and crew access info. The course will be well marked with pink flagging tape plus extra pink pin flags and flour at important intersections. On longer stretches of trail, confidence flagging will be placed approximately every quarter mile. Turns will be marked heavily with 3-4 extra flags before the turn and 3-4 flags within line of sight leading away in the correct direction. The race will start at the gateway to the Soldier Canyon picnic area. Runners will follow the road out of the trailhead and head south on the Lodgepole Drive loop (where runner vehicles are parked) and will continue two miles down the main park road to the Arthur’s trailhead. Take the first left into the Arthur’s horse trailer parking lot and head straight onto the east side of the South Valley loop trail. 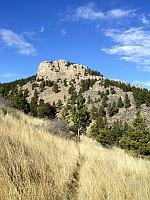 Immediately after crossing the Horsetooth Mountain Park border, turn right onto the Nomad trail. At the next junction, take another right onto the Sawmill trail. Continue up to the end of Sawmill and take a right onto Loggers. In about 1 quarter mile, turn left onto Carey Springs which will take you up to the Towers service road. Turn right on Towers Road (dirt) and continue up the hill until you reach the aid station at the intersection of the Mill Creek and Spring Creek trails. From the Towers Road aid station, turn left onto the Spring Creek trail. A little over 1 mile down the trail, turn left onto Herrington and then take your next right onto Stout near the top of the saddle. Follow Stout for about 1 mile and take the next right onto the Spring Creek trail. 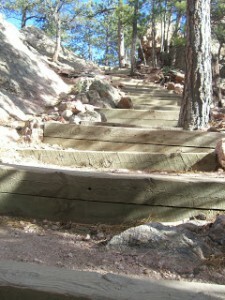 The Spring Creek trail will rejoin the Horsetooth Falls trail in about 0.6 miles. Turn left onto the Horsetooth Falls trail back to the Horsetooth Trailhead aid station, which is also the main parking area for the Horsetooth Mountain Park Open Space. 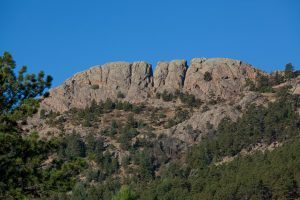 From the Horsetooth Trailhead, take the Soderberg service road up to the Horsetooth Rock trail, and turn left, continuing on the hiking trail up to the Wathan/Westridge trail junction. Turn right off the Horsetooth Rock trail onto the Wathan trail and continue straight (stay left) onto the Westridge Trail and follow it north to Towers Road. Take a right on Towers and the aid station will be right around the corner. From the Towers aid station, take a left on the Mill Creek trail and follow it all the way back to the Arthur’s Trailhead in Lory State Park. Midway down Mill Creek, watch for a sharp left turn at the Loggers junction. Shortly after you enter Lory State Park, the Mill Creek trail will come to a T junction. Take the right onto the Mill Creek Link trail and follow that to the South Valley Trail, where you’ll make a quick left to the Arthur’s Rock trailhead. Start up the Arthur’s Rock trail and about 3/4 of a mile up, take a sharp left to connect to the Howard trail. Follow Howard all the way up and around the back side of Arthur’s Rock. Take a sharp left onto the Timber Trail behind the rock. The first part of Timber is a 4WD logging road. About 3/4 mile down the road, take the 90 degree right turn onto the Timber single track trail. Keep left past Well Gulch and follow Timber all the way to the Timber Trailhead on the valley floor. Exit the Timber trailhead and take the short connector trail back to the Soldier Canyon start/finish. 50 Milers will run the same 25 mile loop in reverse and from the last stop at the Arthur’s trailhead runners will stay on the East Valley trail all the way to the finish area at Soldier Canyon.